When the 747 SuperTanker that was mobilized to help fight the wildfires in Chile pulls into the ramp at the Santiago Airport a series of tasks begin that, if everything goes perfectly, can be accomplished about half an hour. The aircraft arrived on January 25 and since then some of the procedures have been refined in order to speed up the process. Preparing to deploy the refill hoses. There is a small door on the belly of the aircraft that when opened allows access to the hoses used to refill the 19,200-gallon tank. The operator pushes a button and four of them magically descend. Two are approximately 2.5″ or larger and are the ones being used this week. There are two others about 1.5″ or 1.75″ that I have not seen being used. Setting up the monitoring system. Also behind that door are electronic plugs to which a cable is connected. A small folding table and a ladder are carried out by maintenance personnel and are set up below the door. The other end of the cable is attached to a suitcase-sized box of electronics placed on the table with displays for monitoring the compressed air and water (or retardant) being loaded onboard. Early in the morning firefighters begin to configure the water supply system before most of the 14 trucks arrive. 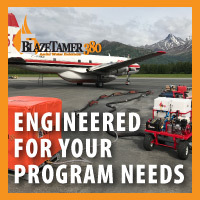 In locations around the world that commonly use large and very large air tankers, a hose is simply connected to the aircraft that supplies retardant or water to fill the tanks. 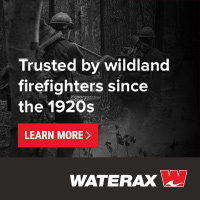 It can come from a batch mixing system that prepares retardant or from a fire hydrant. Since Chile does not have infrastructure for refilling large and very large air tankers and fire hydrants are rare, a water delivery system had to be improvised at Santiago. The water system that firefighters set up at the airport was fairly massive in scope. In addition to two large water bladders, they had eight portable water tanks linked by large diameter hard suction hoses that automatically siphoned water from one tank to the next as the levels in the tanks lowered. There are few if any fire hydrants at the airport near the 747’s ramp so up to 14 large capacity fire trucks, large Type 1 engines and water tenders, shuttled water to keep the portable water tanks full. 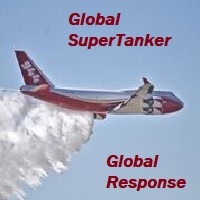 An airport crash-rescue truck pumped from the tanks through two hoses to the 747 SuperTanker. Compressed air is needed on this air tanker to disperse the liquid out of the tank, unlike others that use the force of gravity. When the pilot wants to drop the liquid, valves are opened that allow compressed air to push the liquid through the four large nozzles on the belly. The crew can select how much of the 19,200-gallon load to be dispersed on each drop. They can make multiple drops on one load. The crew brought a rented air compressor with them. They preferred a larger one that could refill the air tanks more quickly, but it would not fit through the door in the cargo hold. After arriving they sought to rent a large one locally but the vendor, Atlas Copco, refused. Instead he donated the use of the large machine since it was going to be used to battle wildfires. The larger one arrived just as the other began to break down. It’s a bad sign when you see jumper cables being carried out to an air tanker. Jim Wheeler, President and CEO of Global SuperTanker, said they intend to purchase a large-capacity compressor that they will modify to fit into the airplane. Sometimes they need to refuel. It depends on the distance to the fire or if they had to loiter, carving circles in the sky (or flying a “racetrack pattern”) waiting for an assignment. This can be one of the most time consuming tasks, and may be adversely affected by the availability of the fuel truck. At this airport the aircraft must be connected to a small vehicle, a “tug”, that pushes the aircraft back and turns it 90 degrees so that it can exit the dead end ramp. In most locations an air tanker can taxi in and out without having to use a tug. In the video below, Chief Paulo Gomez talks about the system at the airport to refill the aircraft. Above: The front page of the El Mercurio newspaper in Chile, January 26, 2017, shows one of the two drops the aircraft made on Wednesday. The arrival of the 747 Supertanker in Chile is generating a great deal of media interest, as well as capturing the attention of the Chilean people. A press conference at the airport the morning it arrived in Santiago drew a large number of reporters who shouted their questions at the government officials who were speaking. Some of the camera operators at the press conference the morning the 747 Supertanker arrived in Santiago, Chile. The largest air tanker in the world combined with the busiest fire season in years and five firefighters killed (one pilot and four on the ground) would be big news anywhere. The expectations of the aircraft may be a little high. Air tankers do not put out fires. Under ideal weather and vegetation conditions they can slow the spread of a fire, allowing firefighters on the ground to move in and construct a line around the fire and actually put it out. The morning the 747 arrived, Alfredo Mascareno of CONAF is mobbed at the Santiago Airport during a press conference about the aircraft and the wildfires in Chile. On its first day in Chile the 747 SuperTanker made two drops on a wildfire but had to abort working on two other targets due to dense smoke over the fires. After arriving in Santiago at sunrise on Wednesday the pilots went to a hotel to get the required rest before they were allowed to get back in the cockpit. The other Global Supertanker personnel spent the rest of the morning and part of the afternoon unloading cargo, configuring the aircraft, meeting with local officials, and confirming logistics and operational procedures. After all of that was accomplished it took off for its first mission, but while en route was diverted to drop on a different location where people were in imminent danger of being overrun by a fire. 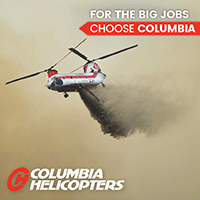 The huge aircraft works with a lead plane that scouts ahead of the air tanker and helps to determine where and how it can attack the fire safely and provide the best assistance for firefighters, and in some cases, residents, on the ground. In this case the pilot of the lead plane and the pilots in the air tanker found that the smoke and the visibility made it unsafe to attempt to drop on the fire. After that decision was made the lead plane and the 747 reverted to the original target. The flight crew watched from a distance as the lead plane flew a “show me” run over the specific target area, indicating exactly what track to take and where to drop the water. 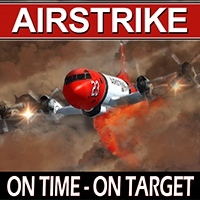 Next, the air tanker made a dry run over the target, that is, without dropping water. This is frequently flown a little higher than the eventual water or retardant drop, to evaluate the effects of wind, convection over the fire, and terrain. Then after doing a large 360 it came around with the lead plane and made the actual drop — in this case, half of the 19,200-gallon load. A little later it made another pass and dropped the rest. After those drops it returned to Santiago to reload with water. Due to the confined space and scattered parked airplanes on the military side of the airport that has been designated as the reload site, or “pit”, the 747 can’t simply taxi in, reload, and taxi out. A tug has to help it maneuver during either the in or out trip. This is a very unusual, almost unheard of, situation for an air tanker that is fighting forest fires. If a few of those parked aircraft were moved it would significantly reduce the turnaround time for the air tanker. It could come in to the dead end ramp, do a U-turn, park, reload, and taxi out. After reloading it flew to another designated target, but again smoke was a serious issue. Both the 747 and the lead plane explored and examined several potential tracks to the intended target, but it was deemed unsafe to attempt to fly through the smoke, so the SuperTanker returned to Santiago and landed with its tanks full, without having to jettison the load before landing like most other air tankers are required to do. Like all air tankers, the 747 can drop either water or long term fire retardant, the red slightly viscous liquid that is seen being dropped from most air tankers in North America, Australia, and Europe. Retardant is more effective than plain water. It actually chemically interferes with the combustion process, while the thickened nature of it allows the wet, ketchup-like substance to stick to surfaces rather than running off onto the ground. But long term fire retardant is not available in Santiago. There are a number of products that can be mixed with plain water to enhance its effectiveness, usually at less than one percent concentration. The one being used by the SuperTanker is Pyrocool which is stored on the aircraft and added to the tanks as needed. 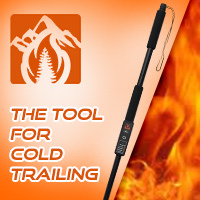 Pyrocool has not been approved for use by the U.S. Forest Service, but has been used on marine fires and on the World Trade Center fire. 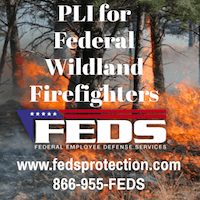 We corrected the article to reflect that Pyrocool has not been approved for use on wildland fires by the U.S. Forest Service, but has been used on some other types of fires within the United States including marine fires and the World Trade Center. Above: Portable tanks storing water that will be pumped into the 747 Supertanker. These photos were taken today, January 25, 2016 the day the 747 SuperTanker arrived in Chile to assist firefighters on the ground who are battling the numerous wildfires in Chile. The air tanker was expected to conduct its first mission Wednesday, dropping water on a fire about 200 miles south of Santiago. The crew planned to mix Pyrocool, a fire suppressant agent, into the water to enhance its effectiveness. Officials confer before the first mission after the 747 SuperTanker arrived in Chile. Local firefighters fill some of the portable water tanks used to reload the 747 SuperTanker. Part of the hose “spaghetti” used to refill the 747 SuperTanker. The 12 passenger seats in the 747 SuperTanker. Most if not all of these are usually empty when the aircraft is performing a mission over a wildfire. The Global SuperTanker crew brought an air compressor (left) which is used to fill the air tanks in the aircraft that provide the energy to pump the water or retardant out of the four nozzles. On the right are containers of Pyrocool which is designed to enhance the effectiveness of water to suppress a fire. The crew also brought a high-volume water pump in case it was needed to refill the aircraft with water or retardant. All photos were taken by Bill Gabbert. Above: The crew from the 747 SuperTanker is welcomed at the Santiago Airport, January 25, 2017. Early Wednesday morning the 747 SuperTanker landed at Santiago, Chile to begin an assignment to help firefighters on the ground suppress some of the many fires burning in the country during an extended drought and heat wave. After landing, the huge aircraft was towed by an airport tug to a remote corner of the military side of the airport where two very large bladder bags had been positioned, presumably containing water to fill the 19,200-gallon tank. It took quite a while for the tug to position the 747 in that location, so the aircraft crew will be working with the locals to reposition what will be a loading pit so that the aircraft can quickly taxi in and out to reload, without the use of a tug. Drug-sniffing dogs searched the interior of the SuperTanker after it landed at Santiago. The first order of business was to bring three drug-sniffing dogs on board. One of them had to be carried up the very steep ladder to the upper deck — not an easy task. Kudos to the dog’s handler who made it look fairly easy, even though the dog looked quite uncomfortable. Jim Wheeler, President and CEO of Global SuperTanker, meets with the US Ambassador to Chile, Carol Perez. After we were bussed to a VIP version of Customs, the U.S. Ambassador to Chile, Carol Perez met with Jim Wheeler, CEO and President of Global Supertanker. Next was a chaotic press conference where Alfredo Mascareno of CONAF, which is the Chilean version of the U.S. Forest Service, was mobbed by several dozen members of the media, including CNN of Chile. Mr. Wheeler told me he was grateful that he was not interviewed. Alfredo Mascareno of CONAF (wearing glasses) is mobbed at the Santiago Airport during a press conference about the wildfires in Chile. The two flight crews will get some rest Wednesday morning, and one of them will most likely be available in the afternoon to fly the aircraft. But many logistical and coordination details still need to be worked out. Above: Ben and Lucy Ana Walton de Availés display a Chilean flag at the door of the 747 Supertanker the day before the air tanker departed for Chile. Photo by Bill Gabbert. The assignment of the 747 SuperTanker to help fight the numerous wildfires in Chile is very different in at least one respect — a private foundation is supplying the starter funds for the huge air tanker to travel to Santiago and for approximately three days of actual use on fires. An heir to the Walmart fortune, Ben Walton and his wife Lucy Ana Walton de Availés, of Denver, have worked out arrangements with the Chilean government and the operator of the 747, Global SuperTanker, to assist the firefighters on the ground in Chile. The funds are being provided by Ben and Lucy Ana’s foundation, Foundación Viento Sur, which has a connection to the Walton Family Foundation. They hope the government will retain the services of the air tanker for as long as it is needed after they see the effectiveness of the aircraft. Lucy Ana Walton de Availés, Ben Walton, and Jim Wheeler (L to R) in front of the tanks in the SuperTanker. Photo by Bill Gabbert. Lucy Ana is originally from Chile and has strong feelings about finding a way to help the residents in her homeland to defend against the fires that have destroyed scores of homes and damaged vineyards, a very important industry in the country. Ben and Lucy Ana visited Global SuperTanker’s Colorado Springs facilities on January 23 and received a briefing on the use and capabilities of the aircraft. Ben has some pilot training and both of them, but especially Lucy Ana, were very enthusiastic about its capabilities and its potential to assist the residents of Chile. Working out the details with the foundation, the Chilean government, and Global Supertanker was a complex procedure that took a few days. Finally late Tuesday morning, January 24, the flight crew received the GO order and departed for South America at about 1:40 p.m. MT. Another cause receiving assistance from the foundation includes Postpartum Support International (PSI), an organization to help women suffering perinatal mood and anxiety disorders. The grant will strengthen postpartum treatment in the state of Colorado, although PSI has global connections. In 2016 the foundation helped arrange for $1.5 million worth of medical supplies to be sent to hospitals and rural clinics in Chile. And they also rebuilt a school after it was destroyed by the earthquake and resulting Tsunami in Chile a few years ago. Lucy Ana Walton de Availés enjoys the classic jet aviator’s pose. The 747 SuperTanker has been dispatched to South America to assist firefighters who are dealing with numerous fires occurring during a drought in the country. The aircraft is expected to depart from Colorado Springs sometime after 1330 MT on January 24 and should arrive in Santiago around 14 hours later after a stop in Houston to pick up a liquid fire suppression agent that will be mixed with water in the 19,200-gallon tank. If you want to follow the track of the aircraft, it will show up as “GST944”. GST used to be used by Ghana Airlines, but the company is now out of business. The initial stage of this deployment, the first few days, is being funded by a private foundation. We will write more about this in a later article. 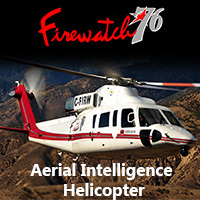 I will be embedded with the crew, traveling with them in order to report for Fire Aviation on their assignment. 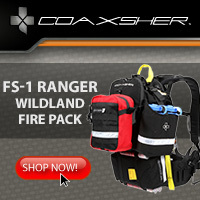 As with any wildland fire assignment, we don’t know how long we’ll be in Chile. The interior of the 747 during the gear loading process. Bill Moody, VP of Incident Response for Global Supertanker, can be seen climbing the stairs to the upper deck. Photo by Bill Gabbert. The fire siege in Chile has been going on for several weeks destroying more than 60 homes and portions of vineyards, an important industry there. As far as we know, Chile has not received much assistance from outside the country. A recent emergency declaration by the President has authorized the use of military assets to help combat the fires. Unusually high temperatures for the last 30 days have contributed to extreme fire behavior. On January 15 three firefighters were entrapped and killed and the pilot of a single engine air tanker was killed December 28 when the aircraft crashed about 15 kilometers from the town of Santa Juana after working on a wildfire in the Bío Bío region. The aircraft was a Single Engine Air Tanker (SEAT), an Air Tractor 802A. Latercera is reporting that an air tanker crashed in Chile Wednesday, December 28 killing the pilot identified as Ricardo García-Verde Osuna, 47. The Google translation is very rough, but it appears that the aircraft went down about 15 kilometers from the town of Santa Juana after working on a wildfire in the Bío Bío region. According to El Día the pilot had not reported any problems with the aircraft. The air tanker was operated by FAASA, a company that has been in business for over 50 years. We send out our sincere condolences to Mr. Garcia-Verde’s family, friends, and co-workers.